A philosophy of essential ingredients designed to help prevent skin sensitivity and increase anti-ageing protection. Natural proteins and vitamins provide protection from damage. 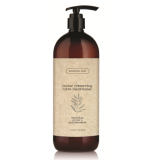 Botanical extracts help to maintain hair and skin’s natural equilibrium. Erythorbic acid, which is similar to vitamin C, is a powerful antioxidant. sulphate, silicone and paraben free A gentle cleanser designed to..
sulphate, silicone and paraben free A gentle moisture rich condit..
Enriched with Geranium Oil and Erythorbic Acid, Elixir Blend provides all hair types with anti-ag..
Natural and coloured hair will benefit from the luxurious shine and antioxidant colour protec..